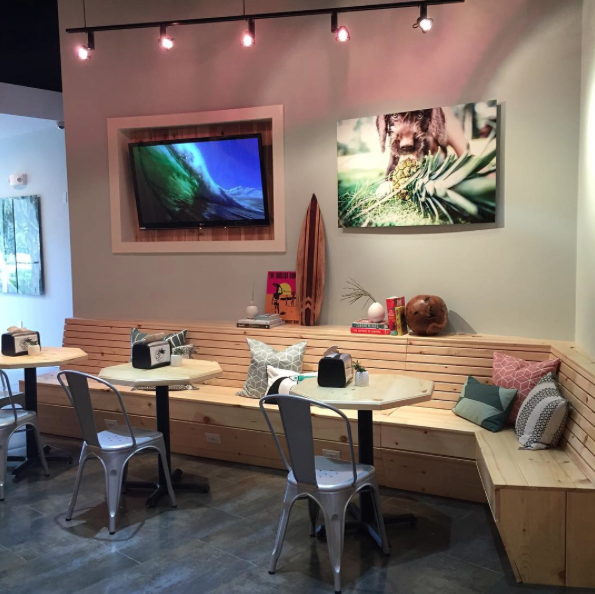 3Natives Acai and Juice Bar is a local love offering a variety of acai bowls, smoothies, juices, wraps, salads and bagels. The vibe is friendly and relaxed where you can lounge and enjoy or grab and go. The Chronic Acai Bowl with organic acai, granola, banana, strawberry, kiwi, pineapple, organic shaved coconut and McCoy’s honey. So good! And sometimes I swap out for some mango. The Curry Chicken Salad Wrap with organic curry chicken salad, romaine, purple cabbage, carrot, red pepper, cucumber, sunflower sprouts, pico de gallo, soy ginger dressing and Himalayan pink salt. I love the crunch and it’s perfectly filling. The menu also includes acai bowls with peanut butter or greek yogurt, wraps and salads featuring tuna salad, chicken salad, or hummus and bagels topped with cream cheese or served open faced. Their smoothies are a combination of organic acai, a variety of fruits and veggies, coconut water, almond butter, cacao nibs and coffee. 3Natives cold-pressed juices range from Easy Greens packed with spinach, kale, celeery, cucumber and apple to Florida Fire with grapefruit, orange and cayenne and Raymond Milk with almonds, Himalayan sea salt, dates and purified water and beyond. They also offer juice cleanse packages and shots like ginger root, wheat grass and turmeric and lemon. If you haven’t been, make sure to stop by and experience the 3Natives lifestyle!